"Hi, this is Sarah. You know what to do!" I hang up my phone and try to focus on the cold grass beneath my body. The stars flirt, winking on and off across a polished metal sky. Blood thrums through the millions of veins below my skin. Anything. Think of anything but Sarah's voice. Except I can't. This is Sarah by Ally Malinenko is not your typical missing persons story. Instead of focusing on the hows and whys and what fors surrounding Sarah's disappearance, Malinenko focuses on the grief process of the two people who may have been closest to Sarah - her boyfriend and her sister. Told in alternating chapters from the perspective of Claire (her sister) and Colin (her boyfriend), the reader gets an intimate look into what, or better who, is left behind. There is limited dialogue; instead, it is more of a monolog of internal thoughts. I felt that Claire's chapter gave the reader information about who Sarah was and her place in their world. Whereas, Colin's chapters are more focused on his grief and how he is coping with the sudden disappearance of his girlfriend - a disappearance that he was questioned in. 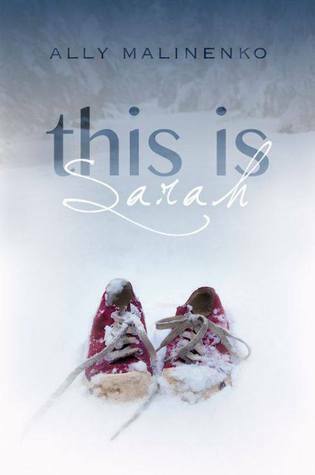 This is Sarah is an interesting story, though I did not feel very engaged in it. I think I only kept reading to see if there would be answers to Sarah's disappearance in the end. I realized that was what was keeping me reading when I read Colin's thought. Or maybe, to be really honest, I wanted to skip ahead all of this, to the end of this story when I know the truth, so I could finally start to heal. I never really felt an emotional connection to the characters, which seems odd given the story is focused on emotions. I felt like the reader was left hanging at the end as to how things went for Claire. At first , I was confused as to why there was so much about Claire in the book if there wasn't going to be some conclusion, but then I thought her role was to give us insight into Sarah since Colin was so wrapped up in his anger and grief that Sarah was "perfect". But as the story is a reflection on grief and not everyone is going to be healed from something like a sister going missing, maybe it is more realistic to leave Claire's ending less tidy. This lack of wrapping up Claire's story gave the ending a bit of a rushed feeling, though Colin's epiphany felt plausible and natural. Like I said, it was an interesting look into the grief process. I applaud Malinenko for going against convention of a missing persons story and focusing only on those left behind. Based on your review, it sounds like the reader would be just an observer of the story rather than being engaged in the story. I don't read much YA but, I hope u enjoy this one.